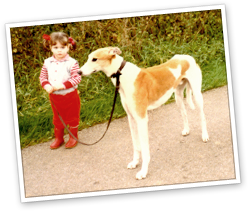 I was about five when my dad first introduced me to greyhound racing, at the local track at Crayford in Kent. I was obviously hooked by ten as I have a racecard dated 1963, and another from nine years later by which time I was a regular. My personal favourites were Quarrymount Jane (striped jacket specialist), Wont Budge (on one occasion trebled my wage packet), The Big Grey (great early pace but needed oxygen last 30 yards) and Taggarts Folly (the opposite). 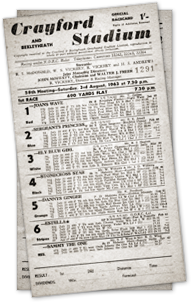 In those days the racing surface was peat, the dogs would briefly seem to disappear as they raced beneath the tote indicator board, and the bookies included the highly respected team of John Humphreys and the late Tony Morris - a true legend of the bookmaking world. The track closed in 1985 but was replaced the following year when owners Ladbrokes built the current circuit just up the road to the original site. Already a keen amateur photographer, I merged the two hobbies in 1984, largely as a result of becoming an owner. Joining forces with three London work colleagues to form a syndicate, we purchased from the Hackney auctions a white and fawn dog called Walshes Glen. 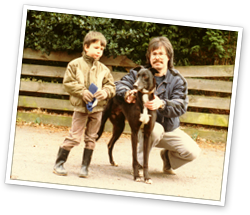 He won a few races for us at Wembley, and bitten by the ownership bug we were soon back at Hackney buying a puppy called Early Again. He gave us some brilliant nights at the old Empire Stadium as he rose through nearly all the grades until a wrist injury put a damper on his progress. He recovered sufficiently to win a few races at Reading before we found good homes for both of them. Around the same time two other far more famous names were giving the sport a high profile – Ballyregan Bob and Scurlogue Champ. They had wildly contrasting racing styles, indeed Scurlogue was a crowd pulling freak with his habit of dropping miles behind before suddenly waking up and producing his whirlwind finish. Bob meanwhile was simply peerless over six bends, a joy to watch in full flow. But their careers, which included their much hyped “Wembley Showdown” in 1985 and Bob’s British and then world records (see below), provided equally valuable showcases for greyhound racing. As I followed these two stars around the tracks, my own involvement with the open race scene took off and I received commissions to supply photographs to The Sporting Life and the monthly Greyhound Star. The Racing Post hit the news stands in April 1986, making an immediate and significant impact as far as racing press coverage was concerned, and providing a major outlet for my pictures. That year they sponsored the “World Challenge” race where a huge crowd and a horde of TV cameras descended on Brighton and Hove track. Ballyregan Bob, expertly handled throughout his illustrious career by training legend George Curtis, duly completed his 32nd consecutive victory. American dog Joe Dump’s previous world record had finally been broken. Stuffed was certainly not a word to associate with Bob when he was racing, but after he finally passed away, he was preserved for future generations. The old boy now stands magnificently as a feature exhibit at the Natural History Museum in Tring. The Racing Post continues to go from strength to strength, and I am admittedly quite proud to have enjoyed our unbroken association since the paper’s launch all those years ago. Back then I would spend many hours in my purpose built darkroom at home in South Cambridgeshire, processing films overnight and hastily churning out black and white prints. After the prints were washed (using an old trick involving methylated spirits to speed the process! ), dried and captioned they would be delivered next morning to the Post’s original Raynes Park location, to meet print deadlines. By 1990, press work had completed the gradual changeover from black and white to full colour processing and printing, with an expanded darkroom operation. 1994 saw the introduction of a computerised system, which included film scanning and sending pictures by modem. Apart from transforming media delivery times it also saved the onerous delivery runs into London. By 2000 it was time to go online, and in 2003 the transition from film cameras to digital capture was well under way. Digital set ups including Wi-Fi now enable pictures to be sent almost immediately to a picture editor’s computer – quite a technological advance in twenty odd years – but there’s still not a button on the camera that makes the tea..